Tagged under Yasuhiro Nightow, Madhouse, Series. 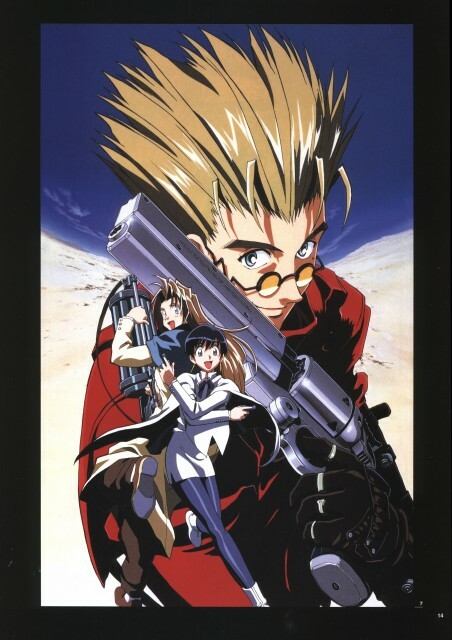 Everyone has heard of Vash the Stampede, the mysterious gunman who seems to cause trouble wherever he goes. He is considered to be very dangerous, so a bounty of $6 billion has been placed on his head (dead or alive); everyone is trailing him to get the money. Meryl Stryfe and Milly Thompson, two insurance agents, are sent out to assess the damages and follow him around in order to prevent him from causing any more destruction. However, when they meet him, they discover he isn't quite the one they expected. Armed with patience, the two set out on a journey alongside him, slowly discovering bits of Vash's past and what made him become what he is today. Over all, I would have to say, I have forgotten how good this anime really was. The depths of emotions which sucked me in and I felt myself tearing up at moments of either happiness, sorrow or moments of giggles when I would watch poor little Kuroneko-sama go flying through the air. It has been a great long time since I have seen this anime, I was lucky to find a box set at the store a few weeks back and I thought, why not, it was reasonably cheap and it's been over a decade since my copy finally gave up the ghost. After I started watching it, it wasn't hard to look past the age, but I still felt it was an anime of it's time, during it's time and honored that a box set was released that I could get my hands on. Really liked this series up until it started to get way too serious at the end... then it just felt like a guy walking to a death sentence (and not fun to watch). The more aloof and fun Vash is the best. Similar to Cowboy Bebop, I never got around to fully collecting the series owing at least in part to a well-dubbed version appearing on Cartoon Network Frequently. I only have the first two volumes (from the original run), but may finish it if a good deal appears. 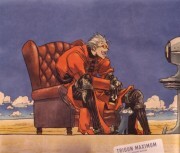 Often seen as the anthesis for Cowboy Bebop, I see Trigun as pretty average as far as characters and story go, I made more of a connection to Bebop's characters and I can't understand all the hype Trigun got when the series was considered popular and I think it is rather overrated. If the series had been made in the same fashion as the manga with the mature content included, then I would've liked it. Being my favorite anime, you might be surprised that I only gave it a 9. I only did this because there wasn't enough of a connection between Vash and Meryl, they should have at least smooched eachother! Besides a few filler episodes with very silly villains, this anime has a wonderful and original plot that has touched me through the years. Alongside the gunmanship and donuts, there was a deep and twisted past of Vash the Stampede that he could not shake or bury...And a special woman that showed him what it meant to be human when he himself would never have been able to understand without her words. Very cool anime filled with awesome characters and insanely entertaining and unique battles. Very unique setting and story the becomes very addicting very early on into the anime. A must watch for all anime fans! This has a special place in my heart, which I gave it the moment I realized how smoothly it went from slapstick comedy to serious sci-fi drama. While the first episodes are mostly comedic, the actual plot is revealed gradually, bit by bit, in each episode. The animation is more on the grungy side (not sloppy! ), which fits the desert setting perfectly. Overall, I think this is a must watch for any comedy and action fan. Own both Manga and DVD series. One of my first adventures into anime after Sailor Moon and i was not disappointed. This was one series i watched before i read. Animation is very well done as well as the English voice casting. Character's are both heartfelt and funny. If your interested in watching a space type western this anime is for you. Action, comedy, romance (kinda), this series has basically everything I look for in an anime that makes it worth watching. The fights are very well done, the hero (though thought of as the villain in the series) is comical but he's got a deeper meaning to him with his past, present, and problems. The side (or other main) characters are just as interesting and funny but lack the extent of depth to them that Vash has. The graphics are good and well-done, the plot is deep along with its characters. Overall, a very good series. anyway........it is related to science yet a bit of it. you know.....during weekends......i watched it all night long!!! Started watching this anime with no expectations and it quickly turned into a "I've got to watch the next episode!" series. Very pleased with this one. Good plot, strong character development, and good mix of seriousness and comedy. Also they did a nice job treading the line of predictability and unexpected things happening, such that it kept you on your toes but still had the "happy ending" feel good quality to it. I'm totally in love with Vash, would stick him in my pocket and carry him away if I could. I'm a total failure of a typical girl, I always fall in love with the goofy guy with the big heart over the cool dangerous bad guy types XD. Love this anime, one of the first I ever watched. It grabbed me from the first episode. Its so hilarious and so deeply moving at other times. ....I always feel weird writing reviews... anyway. I love it.